Why is the cloven hoof of such adorable animals as the deer associated with the devil? If I had to guess, I’d say it has something to do with Pan, the mischievous God of the woods. We also associate ram’s horns with the devil. We often look for symbols in nature, like the dove for peace, to represent ideals that are difficult to express. It’s our way of finding something concrete to ground our understanding. What’s interesting about the cloven foot representing the devil to me, is the word divided. Isn’t that, in fact, the way evil works, to divide people, to make them not trust one another, to hate one another over superficial traits, like skin color, class, and sexuality? 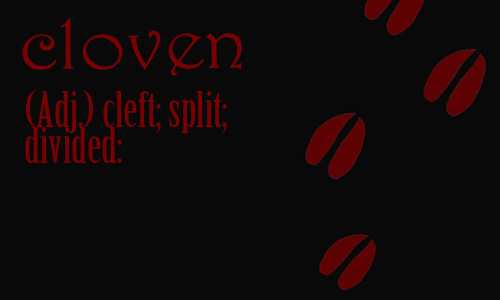 The more I think about it, cloven is a precise representation of the devil.